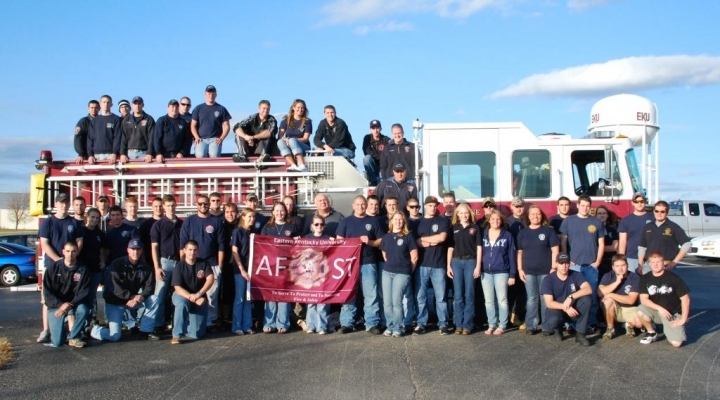 The Association of Fire Science Technicians (AFST) is a student organization that is designed for students in the Department of Safety, Security, And Emergency Management at the College of Justice and Safety here at EKU. We take great pride in our school, and are pleased that our program is the only program of distinction at EKU. AFST aims to promote the art and science of Fire Protection Engineering and its allied fields, maintain a high academic and ethical standing among its members, and to foster Fire Protection Engineering education. We also strive to maintain a positive influence on the community through community service and unite the brothers and sisters here in EKU’s FSE program that are preparing to enter a career in the fire service and safety fields. We invite you to check out our website and tell us what you think! Also, browse our extensive photo gallery to see AFST's members in action.